Home » Dyeing » Bramble Crumble Anyone? What do you get when you take an ecru yarn, dyes, water, heat, a bit of time, the internet and a crochet hook? Added them to a dye bath and then dried the coloured yarn… overnight…. 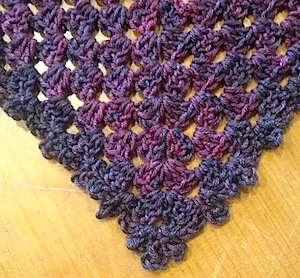 Then I searched the internet to find a triangular granny square shawl pattern which I found at The Sunroom. 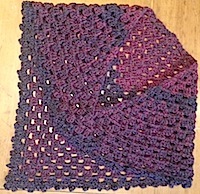 At this point I had to do a little trialling with crochet hook sizes to decide for the shawl to be soft and drape well I needed to use a 6mm hook rather than the 3.5mm needle size advised on the ball band. So… pattern, hook and dyed wool in hand I set off. Total crochet time… just 4 hours. 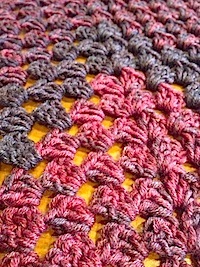 I adjusted the edging too (cannot help but adjust a pattern to suit me)…. all I did was 5 Ch, slip st into next gap, 5 Ch, slip st into SAME gap and repeat. It worked well for me. It gives a pretty frilly edge. So… I’ve had fun in the last 24 hours, as well as a lovely evening out with friends and tangy lemon tart. Three of my favourite things… creativity, friendship and there’s nothing quite like a tart lemon tart. 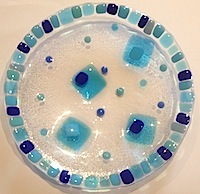 AND… whilst I crocheted my kiln was slowly doing its magic… and look what came out! What a madbird colourful, creative few days I’ve had!